Add excitement to your mini albums with C-Line's 8 x 8 inch Combo Kit. Each kit contains a combination of page styles that allow you to create unique scrapbook layouts. Made from acid-free, archival quality polypropylene. 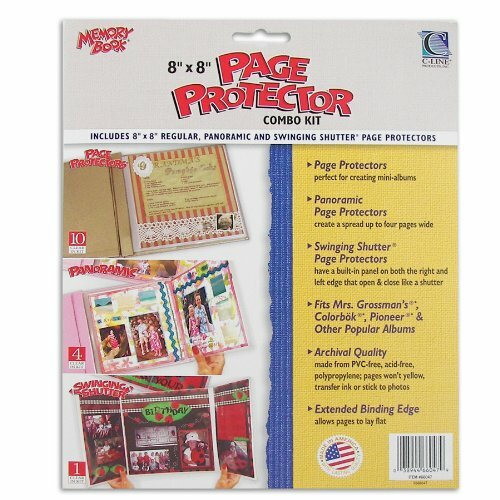 Includes 10 Regular, 4 Panoramic and 1 Swinging Shutter Page Protector. Fits Mrs. Grossmans, Colorbok Pioneer, and other popular albums. 15 pages per pack. With over 60 years of experience, C-Line's many product offerings include sheet protectors, name badges and holders, shop ticket holders, media storage products, laminating film, report covers and project folders, photo holders, Memory Book page protectors, office accessories, transparency film and more.